Rosherville Gardens was one of the largest and most popular Victorian pleasure gardens. It survived for seventy years, having been laid out in 1837 and finally closing to the public just before the First World War. The gardens were built in a disused chalk pit near the River Thames and two hundred yards north of London Road in Northfleet. The northern boundary was Crete Hall Road and the southern boundary was the chalk cliffs of the old excavations. Much of the land in the area belonged to Jeremiah Rosher who had invented the name Rosherville for this part of Northfleet, next to the river and adjoining Gravesend. George Jones, a businessman from Islington, formed the “Kent Zoological and Botanical Gardens Company” and persuaded people to become shareholders. The company leased the chalk pit for 99 years from 1837. The gardens were laid out with a terrace, a bear pit, an archery ground, a lake, amaze, flower beds, statues, a lookout tower on a spur of rock and winding paths. They were intended to appeal to wealthy visitors with serious tastes. However, the wealthy visitors never came in sufficient numbers and to save the gardens, Mr Jones was forced to lower the prices and import more entertainments. From 1842, the educational aspects were forgotten and the Rosherville Gardens as they were now called became an enormous success. Visitors flooded in from London on the steamboats, landing at the nearby Rosherville Pier. Baron Nathan, a dancing teacher from Kennington, was permanently installed as Master of Ceremonies in the Gothic Hall in 1842. He remained until his death in 1856. The Gothic Hall was used as a restaurant, ballroom and theatre. As time went by, the hall was extended but was still too small for the crowds of people. An outdoor dancing platform was built outside the Gothic Hall in 1860. A Drawing Room Theatre was built adjoining the Gothic Hall but proved to be too small and inconvenient so the Bijou Theatre was built nearby in 1866. An open-air stage was built by the dancing platform in 1873-4. Performers in the two theatres and on the open-air stage included, over the years, the Lupino family, James Hillier, Henry Forrester, George Mozart and Arthur Williams. Other entertainments at the Rosherville Gardens included fireworks, tightrope walkers, balloon ascents and a gypsy fortuneteller. For many years the firework artist and tightrope walker was Signor Gellini, whose real name was Joseph Gyngell. There were several other tightrope walkers – the “Female Blondin” (Selina Powell) in 1862 and “the African Blondin” (Carlos Trower) in 1881 and 1882 amongst others. A new entrance was made from the London Road through a large conservatory in 1869. A large clocktower was built by the side of the gateway. Steps inside the cliff led down to the gardens below. George Jones died in 1872 and the Gardens passed into the hands of the “Rosherville Gardens Company Ltd.” From then on, paid managers administered the Gardens. 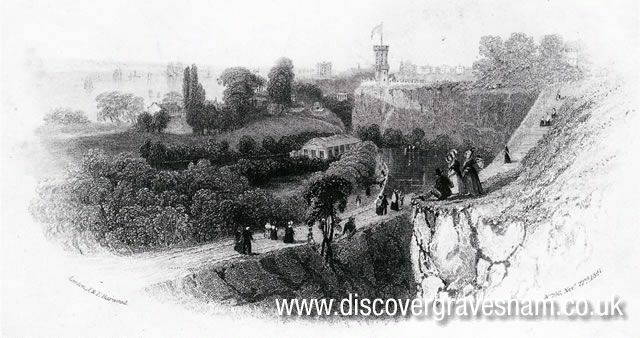 The sinking of the Princess Alice paddle steamer with great loss of life in 1878 started the decline of the Rosherville Gardens, which had begun to go out of fashion as Londoners could afford train trips to seaside resorts. In 1900 the Rosherville Gardens went bankrupt and the following year many of the fixtures and fittings were sold off. The Gardens remained closed until 1903 when they were re-opened, having been bought by some local businessmen. Changes were made. The maze and the dancing platform were swept away. The Bijou theatre became a restaurant. The outdoor stage was refurbished and called the Café Chantant. Films were shown in the Gothic Hall. A small menagerie was acquired, including a baby elephant called Kim. Despite the best efforts of the various managers the Rosherville Gardens were losing money. They closed as pleasure gardens in 1913. In 1914 the Magnet Film Company made a film there and proposed to make more but the First World War closed the Gardens completely. In 1924 five acres of the land was sold to W T Henley’s Cable Works, which had occupied the land between Rosherville Gardens and the Thames since 1906. In 1939 Henley’s bought the rest of the land and the site was completely cleared. There is a complete history of the Rosherville Gardens written by Lynda Smith and published by the Gravesend Historical Society. ‘The Place To Spend A Happy Day’ A History of Rosherville Gardens. 2006. See Publications.